Jillian over at Cornflake Dreams is hosting a Blog Crawl this week, so I thought it would be fun to link up & share my dream decorating space. I often dream about creating my perfect bedroom, or house for that matter (...one day). 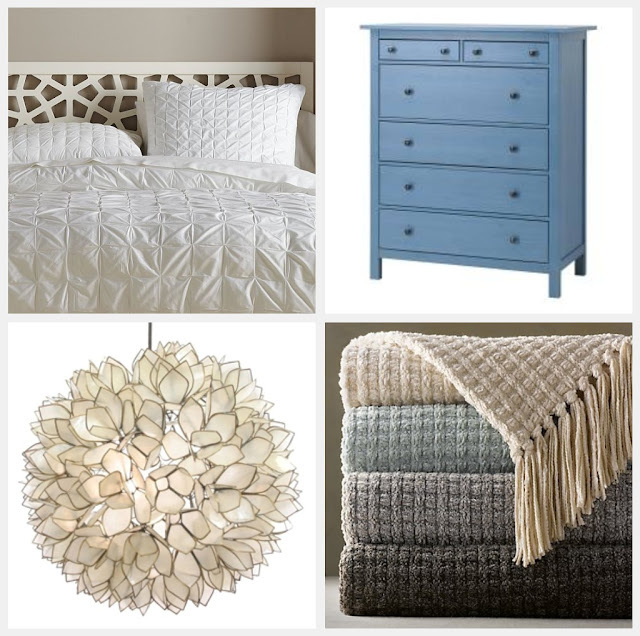 I have chosen some pieces below that I would love to place in my bedroom (some of these I already own!) for a perfectly relaxing space. Bedding: I love how simplistic, yet elegant West Elm is. I've always been a HUGE fan of light, simple bedding, too. I like to keep the largest piece of furniture in my room simple & add little details everywhere else. IKEA Dresser: I actually own this exact dresser & I love it! Chenille Throws: I actually own a few of these, too! I love having an extra soft blanket at the edge of my bed, just in case it's a warm night & you don't need your comforter. & they just look pretty! Lotus chandelier: I love the idea of a few of these lotus lights hanging in the corner of my room. Do you have some interior decorating dreams that you want to share? i want this bedroom! i especially love the blue dresser with miss-matched knobs. I'm ready to crawl into that bed and take a nap! im pretty sure this will be a beautiful room! I have the dresser too! I love the dresser. Does it come in that color or did you paint yours? The mismatched knobs are awesome too! Jeny - I bought the dresser in that blue color. I looked online & didn't see it offered in blue - maybe they don't make it in blue anymore?? I love the door knobs - I am trying to create a door knob collection myself. Love the eclectic knobs (like bursts of color) and the textured white bedding. Wow, what a great dream bedroom! Oh my that is a pretty chandelier!